Call 866-4TRUMAN Today to Ask About Our Current Specials! The Truman Key West Hotel is newly renovated with clean, spacious rooms. 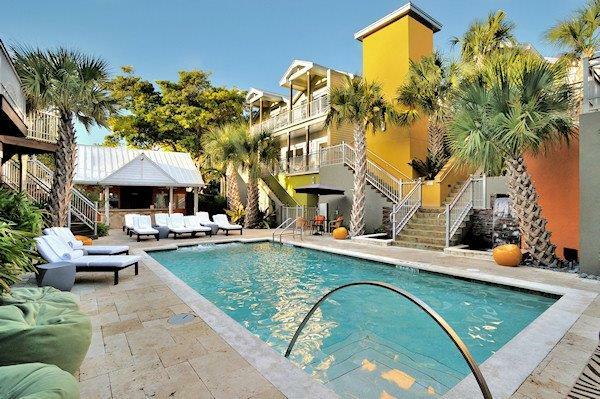 Our vacation lodging in Key West remains the best in town — just one block off Duval with plenty of parking. Our Key West Hotel is located one block off of Duval Street, right in the heart of Old Town Key West! Our courtyard and pool area is open and spacious and a great place to read, sun, or visit with friends. The landscaping provides perfect shade & colorfully compliments the walkways and our vacation lodging rooms in Key West. Hemingway's House, the Southernmost Point, Sloppy Joe's Bar, Jimmy Buffet's Margaritaville, Mel Fisher's Treasure Museum and world famous Key West Sunset & much more all within reach of our Key West lodging suites! The Truman Hotel is a popular guest favorite - an amazing color palate, local art, and unusual pieces make the Truman Hotel rooms in Key West unlike any other.